Ah, a farmer’s life. There’s never a shortage of work? You have fields to plow and hay to put up. It’s a time demanding career, so don’t dally. I mean, there’s only so much room in the barn and you don’t want the competition squeezing you out. But farm smartly – not only do you want to be quick, but you want good prices, too. There are no government subsidies to bail you out in this game! Fill the Barn certainly can’t be accused of misleading anybody. It is aptly titled. Specifically, you plant and harvest various crops to fill up a barn. But you need to make a little money in the process. After investing the cash for seeds and harvesting, you hope to sell your produce for a hefty price. I mean, have you seen what a new combine costs? Players begin the game with $1,000 in cash and a hand of five cards from a large deck. The majority of these are crops, one of six different kinds that you can farm in the game. A few let you plant them for free, but most come with a price. 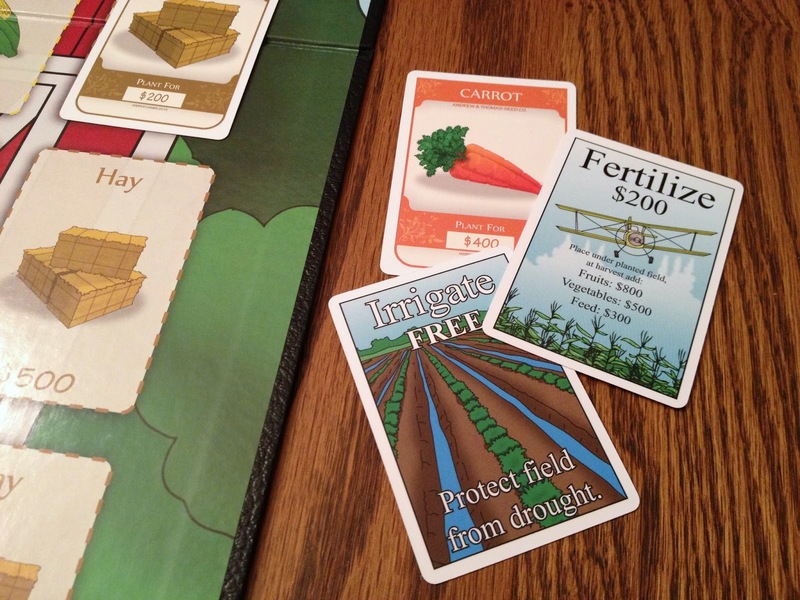 To plant a field, simply lay any crop card in front of you and pay the required fee. To harvest that crop on a later turn, you’ll play a harvest card. These make up another large percentage of the deck. Again, there are a small number that are free, but the majority will cost you. To take in the crop, just pay the price and place the crop card in the barn. Claim those spots while they’re hot! Here’s where you earn money. The barn only has three spots for each of the six crops, all in incremental pay-outs. Strawberries generally fetch the best yields followed by watermelon, then carrots and potatoes, and finally corn and hay. The concept is similar to a basic stock market game – buy low, sell high. Except in this case – plant low, harvest high. The aim is to fill a spot in the barn that will earn as much as possible over the combined costs of planting and harvesting that crop. What could be better than cornering the carrot market? On second thought, don’t answer that. 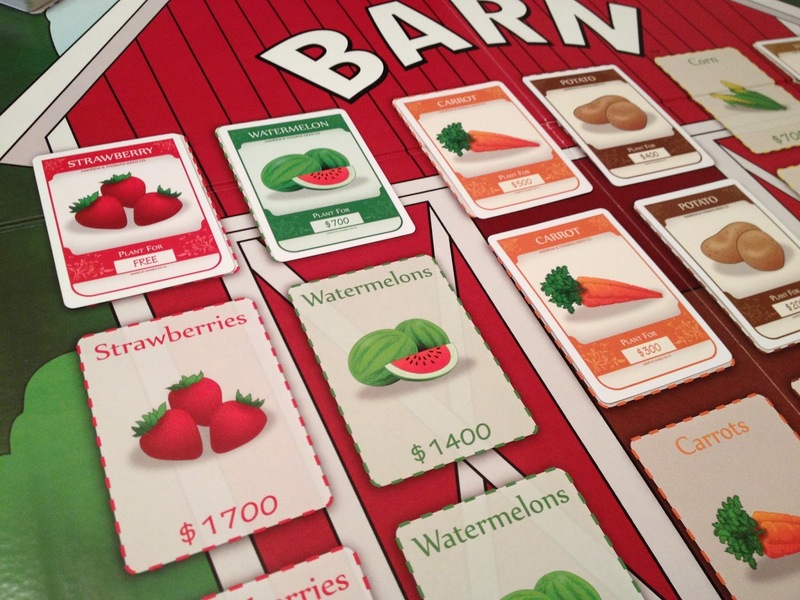 In addition to this basic economic engine, Fill the Barn includes a number of cards to spice up play and work with the draw’s inherent randomness. Perhaps the most significant are the interactive elements. 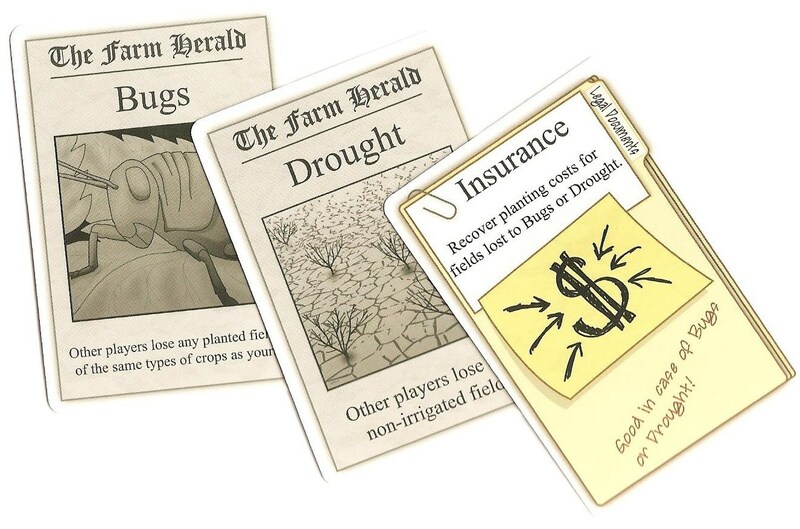 Two cards, Drought and Bugs, let you play mean and nasty, destroying your opponents’ crops – a pretty substantial addition for a children’s game. Thankfully, there are some cards, namely Irrigation and Insurance, to ward off dry spells or get your money back when that happens. Some other cards, while not as spiteful, can be a nuisance, forcing players to trade or swap cards with you, while sticking them with near worthless trash at the same time. Once all of the barn’s eighteen spots are filled (or if the deck is depleted first), the game ends. The farmer with the most money wins and gets to complain the least. I mean, you won’t completely stop complaining, because, well, you’re farmers – and that’s what farmers do. Fertilizing and irrigating your fields. Really, farming’s such a simple concept, even though its hard work. Plant the seeds and let nature take over from there. Of course, we need ever increasing yields per acre and tastier produce, so we break out fertilizer, insecticide, and herbicide and spend millions of dollars to genetically enhance corn’s DNA. I guess the earth needs a little help. In a sense, Fill the Barn plays in a similar manner, without the sweat and an R&D budget the size of Iowa’s GDP. The game is very simple and flows intuitively. But there are some special cards which can boost your score. 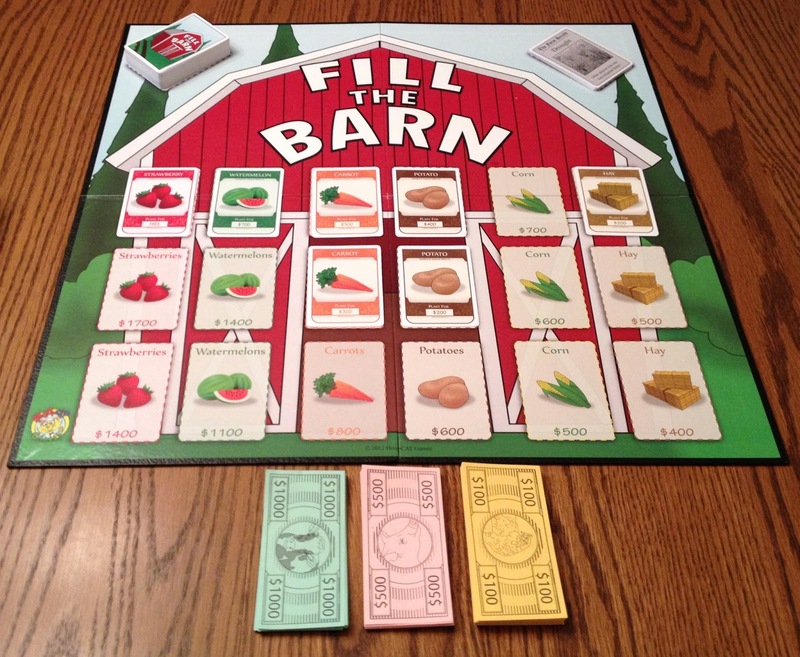 While not strictly a stock market game, Fill the Barn introduces the basic principles endemic to such economic themes in terms that children can easily comprehend. The goal is to plant and harvest crops for as little as possible, and try to get the most lucrative spots in the barn. Therefore, any kid that knows his/her numbers will have no trouble with this manageable design. And he/she will be practicing math at the same time. There is text on the cards, but my Kindergartener quickly memorized which ones have what special powers, despite not being able to read them. 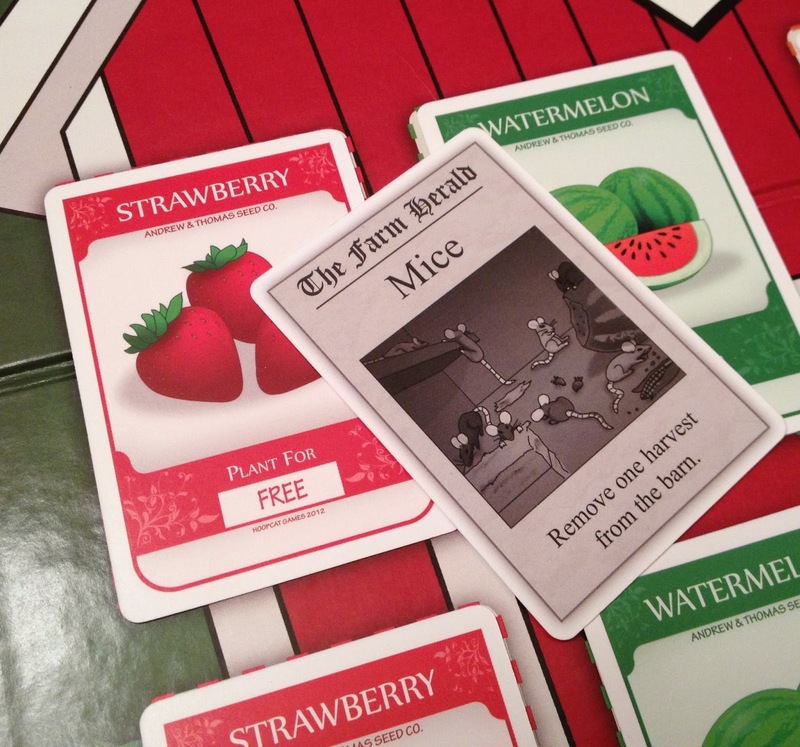 Mice are good in this game – clears out a spot to fill back up and earn more money. If planting and harvesting were all that Fill the Barn offered, it’d probably feel like real farming and grow intolerably stale after a dozen or so turns. Thankfully, the special cards create some extracurricular activity – especially when you find yourself without any useful cards with which to sow or reap. Fertilizer is nice to have to increase the price of a harvest. If you discover a sweet deal on a particular crop that’s already filled-up in the barn, you can use Mice to clear out one of those spots to make it available for you. You can even fill up an empty spot with useless Junk to deny it to others, or simply hasten the game’s end. There’s just enough variety to keep things interesting and moving along, without bogging down game play and confusing kids…or adults. The spite factor may be an issue for children. Indeed, I was mildly surprised at its inclusion. Yes, you can get some shelter via Irrigation and Insurance, but not always. Actually, the best defense is to make sure that you harvest as quickly as you can – and don’t leave yourself vulnerable to significant loss by having multiple, unprotected fields. Losing one crop, or a couple minor ones, isn’t too terrible and easily recoverable. Personally, I don’t have any qualms about the level of interaction. In fact, I’d recommend it to get your kids used to this aspect of gaming. Still, some kids may have trouble, in which case it’s easy enough to simply remove those cards from the game. Spite and the insurance against it. The trade cards are the only questionable special actions. Sticking a player with a high cost crop or harvest card that he/she is unlikely to play is a fun way to get rid of junk. But you usually don’t get much in return. Every so often, you’ll be able to force a player to give up a nice play. However, most of the time, you’re simply trading trash for trash. One of the trade cards lets you peek at an opponent’s card first, but then you must take it or a different, random one. Actually, the only strong con that I have with the title is that the price point is a bit high for what you get – essentially, a deck of cards (albeit a lot of them), some paper money, and a board. Admittedly, the board is well-made and big. In fact, really it’s unnecessarily so – the spots for the draw deck and discard pile are out of reach for kids sitting opposite; make sure to put a parent on that side. Even if you don’t use the provided space for the cards, that board is still in the way. The cards are average quality and the artwork is very pedestrian. Now that’s a barn raising! 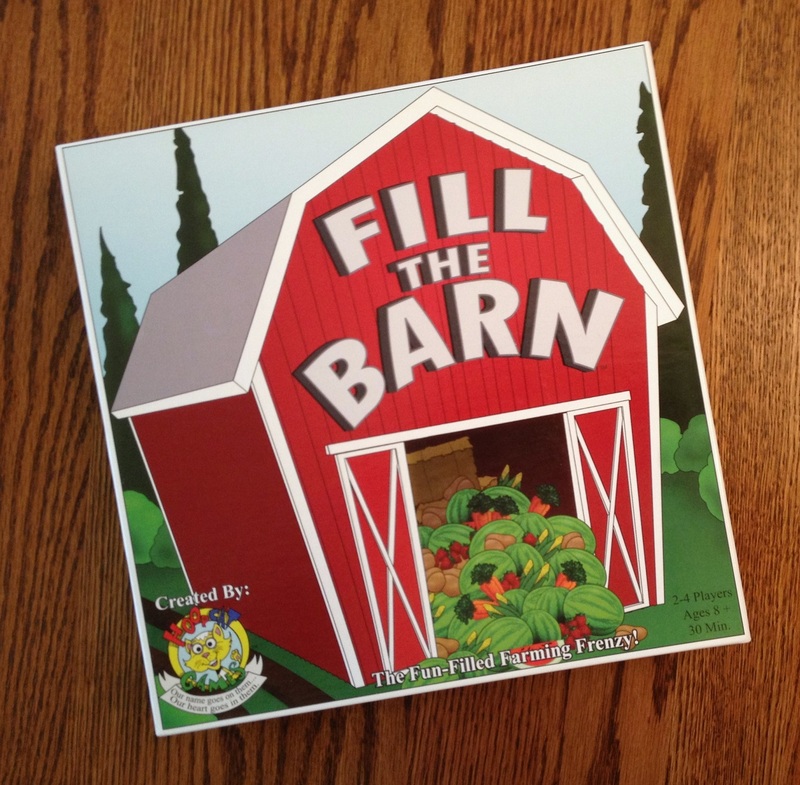 Fill the Barn is an easy-to-learn, fun-to-play family game that works for younger and older kids alike. The younger tykes may need a little coaching until they really get the “buy low, sell high” concept, and you may consider removing the spiteful cards. However, this is also a good choice to introduce little ones to both of those concepts, which are typical in the hobby. Perhaps best of all, with no downtime and actual decisions to make, parents will genuinely enjoy it with their kids for the game play, as well as bonding time. iSlaytheDragon would like to thank Game Salute for providing a review copy of Fill the Barn.